At the dawn of this console generation, Ubisoft had been working on a Prince of Persia game set in the modern day - but scrapped it before it was ever announced. The Prince of Persia series had quite a good showing last console generation, but sadly has been mostly forgettable this time around. 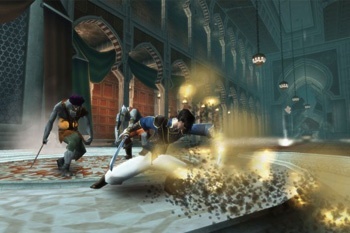 While Forgotten Sands was set in the middle of the last-generation Sands of Time trilogy, and Prince of Persia (2008) had a more fantastic feel to it, Ubisoft had toyed with another setting for the Prince: the present day. Speaking with Xbox 360 World, former Ubisoft artist Jonathan Jacques-BelletÃªte - currently the Art Director at Eidos for Deus Ex: Human Revolution - said that Ubisoft had originally planned to start the Assassin's Creed franchise on the PS2 and Xbox. After that original Creed was canceled, "[Ubisoft] wanted a spin off for Prince of Persia. We had some awesome ideas with that too ... in contemporary time." According to Jacques-BelletÃªte, work had already started on the 2008 iteration of the game, and this was an entirely separate project. "[Ubisoft] wanted really something completely out of the left field. And back then I was known as one of the ones ... 'oh this guy can get some pretty cool, weird ideas.'" From the sound of it, the game was almost post-apocalyptic, in a way. "Think a bit Day After Tomorrow, but replace the snow with sand and everything. It was really wicked." Sadly, the game was canceled and the team moved on to Far Cry. A shame, too - I'd have loved to see how the Prince would have handled an environment filled with skyscrapers and steel.